The elegance of outdoor landscape lighting can be yours. Outdoor landscape lighting adds elegance and interest to all of your outdoor landscaping. 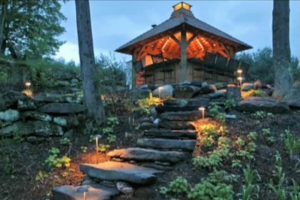 Enjoy your landscape day and night, by adding a few low voltage lights to accent trees, shrubs, flowers, walls and walkways. 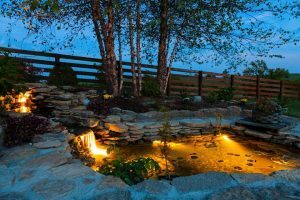 Not only will it add beauty to your landscape, it provides additional safety as your friends and family walk around your yard at night, while you are entertaining or just enjoying the night sky. We can custom design outdoor landscape lighting to fit your budget and space allocations. Peterson’s has been awarded the “Outdoor Lighting Company of the Year Award” because of our attention to details and our design options. Our lighting professionals will come to your property and assess your site for the best layout based on your goals: whether you want to extend your time outside at night; highlight a key feature at your home; set the mood for a quiet time with your loved ones, or be able to light up a big festive event. We can even set up a FREE lighting demonstration to show you the various techniques and fixture options we offer. 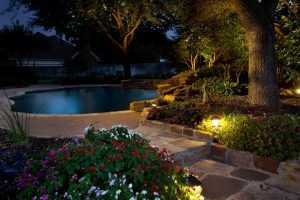 With so many outdoor lighting techniques that can create various looks, you want to work with a professional to make certain you are considering all the factors in selecting and placing the right type of lights. We can even install low lighting systems that give you the ability to control brightness levels. There are also options for being able to turn on and off your lighting system from your computer or handheld device. 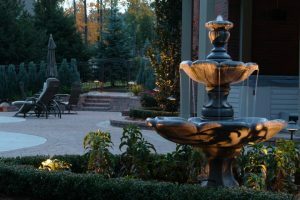 Landscape lighting adds a dramatic flair to outdoor water features. No outdoor landscape lighting job is too big or too small. Pathway lights to a pool.